As healers we strive to find the spark of light in the seemingly fixed nature of our clients condition. This means that we must find the potential for change and healing in situations where it seems nothing is possible. How do we find an orientation that calls to potentiality, opening the door for healing and change? The healer acts as a gateway between the current reality and the energy of potentiality with which the body has lost connection. Staying poised in this zone of the paradoxical between what-is and what-could-be is an extraordinary act. It requires inner quiet and subtle attunement with the higher frequencies of energy that transformation draws upon. We have developed work with the nervous system to silence mental chatter, calm anxiety and lessen reactivity for both healer and client. From this we can open to higher energies that transcend the narrow view of current limitations. This also develops energy skills that support relaxation, lessen anxiety and develops resilient rather than reactive responses to stress. Practical energetic work with the nervous system to create deeper centering in ones body. To access higher states of awareness and poise that bring the energy of possibility. 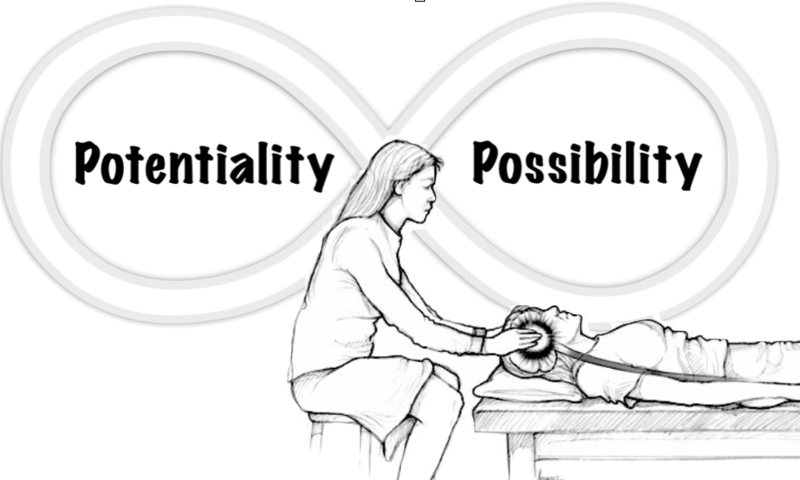 To generate a state of potentiality/possibility within the fixed condition of body tissue, illness, or trauma.